The USB Cable Management original pin. I can never find the right USB cable that is attached to my computer. One allows me to charge and access my phone the other allows we to get the photos off the camera. So when I saw this pin I thought that it was a great idea. It flopped the first couple of iterations, mainly due to my desk. 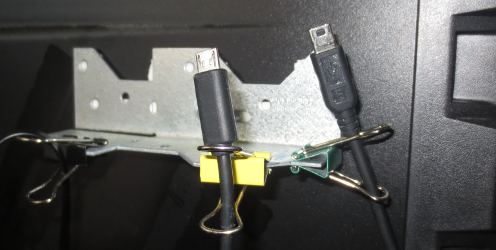 The first set of binder clips I bought were to small and the cables didn’t pull through easily and they could clamp on to the thick top of my desk. The second set were bigger and the cables pulled through easily but they still didn’t fit on my desk. That led to attaching them to a ruler that I then had sticking out from my desk and wedged under my computer. That worked but was not ideal. The final iteration was the piece of metal that I found in the hardware store and some double sided foam tape. This is working great. I can always find the right cable. The last cable is for my headphones and lets me keep it reeled in. All in all I would consider it a flip but it took some work to get there. 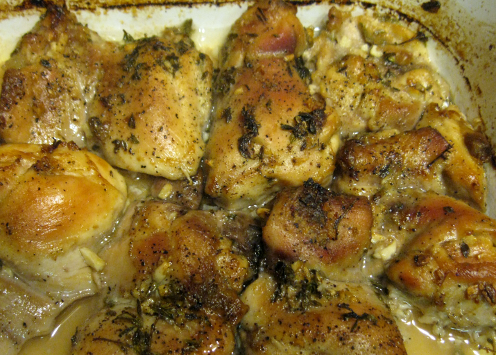 Lemon Thyme Chicken original pin. Second up is Lemon Thyme Chicken. This one came about because the kids came home with Lemon Thyme from Grandpa’s garden. They wanted to make something with it and chicken was on the menu already. A Google search brought up a Pinterest page. It looked good although my wife’s description was ‘Anaemic’. I had to make a number of changes. First I only had boneless skinless chicken thighs. Second I had to substitute lemon juice from a bottle rather than fresh squeezed. One lemon equal 1/4 cup of juice. I also added more garlic, probably close to double as that is how my family likes things. I would make it again as is but I think this is going to evolve into something different rather quickly. I already have ideas for changes. So again I would say flip. 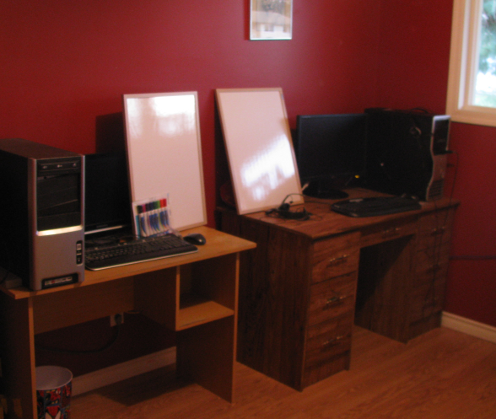 You know you are a homeschool blogger if your plans to completely redo the schoolroom gets moved up 2 weeks so you will have photos for the “Not” Back to School – School Room Blog Hop. It is not going to be completely done. I have come to the conclusion that some of those “Mom” things are actually Stay at Home Parent things. The addition of my daughter to our homeschool has resulted in me wanting to rearrange a good portion of the house. First I want my youngest son’s room as our new schoolroom. Since he generally sleeps with us or on the couch after he has fallen asleep watching TV with me or mommy. This has to end and when asked he said he would sleep with the big kids. They have loft beds and share a large room. So we agreed to add a wing on to the loft beds for Ian. Then I saw this pin on Pinterest. We are not following it exactly but making it work for us. We happened to have shelves downstairs that would fit the space. Unfortunately they were full of books. That meant I had buy, and assemble the shelves. Then move all the books. The bigger shelves would fit perfectly where we had a different smaller set. So that one got moved into the kids room. It was all their books anyways. Our new bigger shelves took its place and got the books from the two smaller shelves. Those are upstairs and now in the closet. The current school room will suddenly be unoccupied. So I had the thought of moving the craft area to this room since it is currently in a corner of my laundry room and it is tight in there. 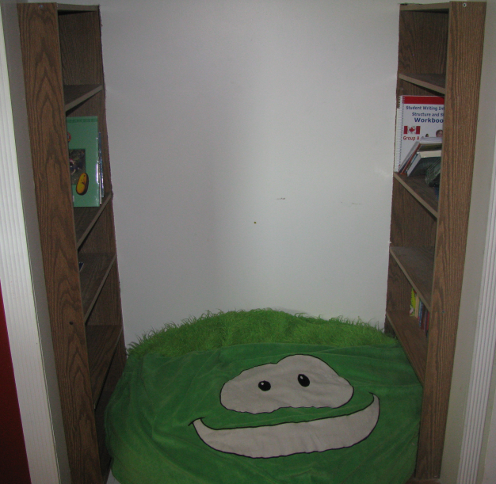 That leaves that area open so we can move stuff out of the storage room so that eventually when one of my kids wants their own room we can convert it. So now it is Sunday night and I am finishing off this post. We are almost done. The desks are setup all the books are rearranged. Basically I could homeschool in here. There are a few little odds and ends that need to be addressed. First we have to finish hooking up the network to the computers. I need to buy a shelf for our printer and wire that up. The white boards still need to be installed. I also saw another pin that I want to do and I have everything, I just need to put it up. 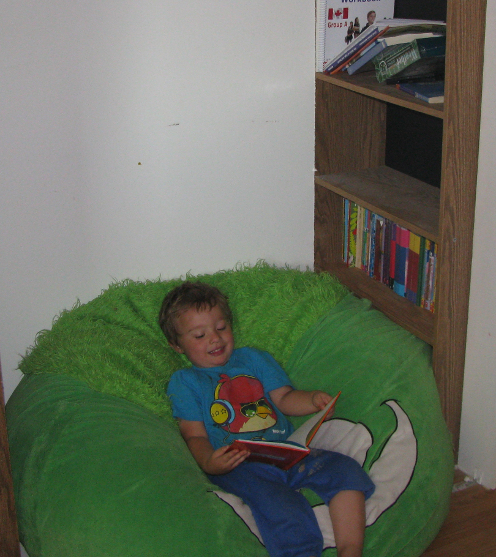 I loved how the reading nook came together but I guess I should show the rest of the room. 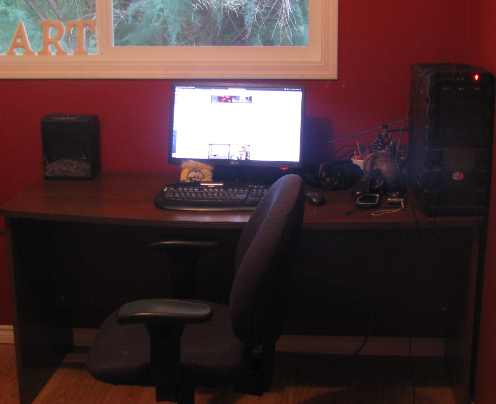 First up our the two older kid’s desks. Second would be the area for Ian to do some preschool. 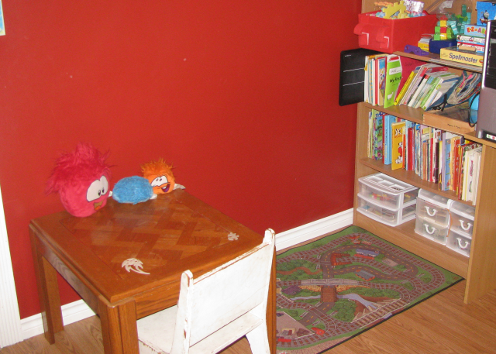 He currently attends twice a week at a Y preschool but he has shown an interest in doing more at home so we have gathered everything it to one area. That should help with organization and allow me to help him better. Finally it is my desk. We had to take it apart to move it from the old room to the new one but it was worth it.